360 photos and videos look really cool. I am sure you have already seen such kind of photos and videos on Facebook or any other platform and thought to try it. You need a good 360 degree camera for capturing 360 photos and videos. I have already made a list of best 360 degree cameras. You can check that list. But what if you are not in condition to pay for a 360 camera. Well, there are few apps that allow you capture 360 photos from your smartphone camera. Yes, this is true. In this article, I am making a list of best 360 degree camera apps for Android. All these apps work fine and allow you capture 360 degree photos from your Android phone. Here is the list of best 360 camera apps for Android. Panorama360 by TeliportMe is also a cool 360 camera app for Android where you can capture 360 photos and explore 360 photos shared by others. You can Capture 360 degree pictures using panorama. It also allows you to share those 360 degree photos on Facebook, Twitter and Tumblr. You can also connect the app to 360 cameras to record photo from the camera and share here. Google Street View is a nice app to explore the world.You can go inside different places like museums, monuments and restaurants and feel like you are in that place. 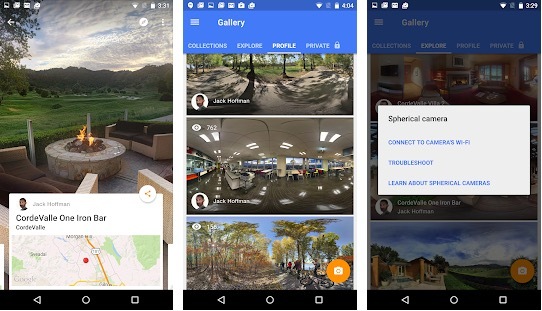 Along with exploring the world, the app also allows you to create 360 photos using either your phone’s camera or a certified Street View Ready camera. You can then share that photo to Google Maps or Facebook. You can also view that photo using Cardboard mode. Cardboard Camera is also a nice 360 degree camera app that lets you capture and share moments in VR photos. You can capture 360 Degree VR 3D photos and save it directly to Google Photos App. You can also record 360 Degree Videos. Everything you can capture using this camera app can also be shared on social channels. 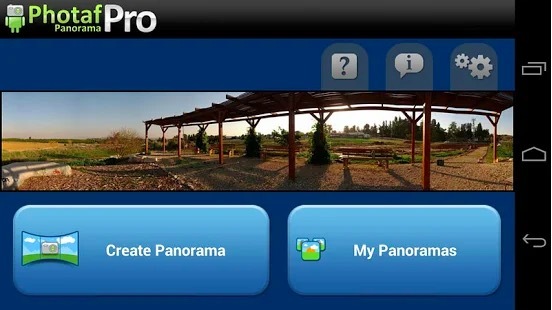 Photaf Panorama Pro is also a good camera app to capture 360 panoramic photos. It uses the camera and orientation sensor to know the exact angle each picture was taken. After capturing the photo, you can move your phone around to see the complete panoramic view by Ising phone’s compass or the touch screen. It uses automatic Image Stitching for creating 360 photos. You can also share the photos with friends. Now you have a list of best 360 camera apps for Android. 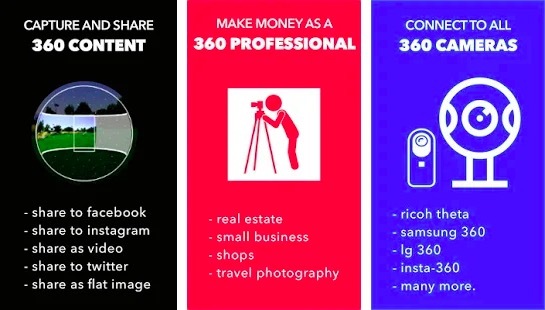 You can start using these apps to capture 360 photos and share it on social media. Facebook and Google Both support 360 photos. There are also few other platforms where you can share and explore more 360 photos and videos. On Play Store, you could find more apps claiming the same, but not all work fine. So, I added only 4 but working apps. If you know any other good 360 camera apps or Android that I missed to add, let me know in the comments below.